Quainton cottage has two bedrooms MES on the upper level and there is a second bathroom downstairs. There is a lounge, separate dining area, small study area and a fully fitted kitchen with dishwasher, washing machine and tumble dryer. 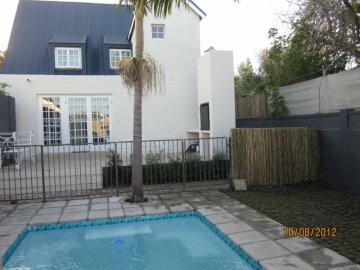 There is a built in outside barbeque, and a swimming pool 5 x 4 metres. The main bedroom has a king sized bed as well as a small single bed. The second bedroom has two singles, and there is another small single bed downstairs in the lounge area. The Nook has a main bedroom with double bed, and there is a loft room above the main bedroom with a double futon bed suitable for children or young adults. The main bedroom and loft room share a bathroom. There is also a separate guest suite outside with two single beds and a small bathroom with shower but no bath. The Nook has a fully fitted kitchen, a small lounge / dining area and an outside courtyard with weber barbeque. It is ina pretty 'English country garden ' setting. Facilities include a washing machine and tumble dryer.